Zing i Sydney, Australien: Reservér nu! One nights cancellation fee applies. 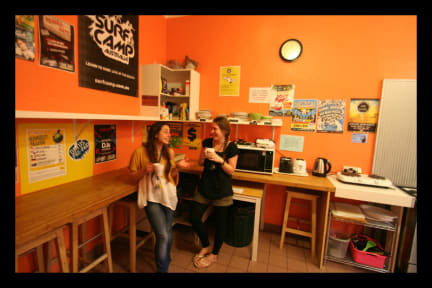 With the largest dorm only 6 beds, we provide a space where you can relax and be yourself as soon as you arrive, brilliant for the independent traveller that does not want to get lost in the crowd. Our bathrooms and common areas are thoroughly cleaned each morning and throughout the day, and our dorms are regularly 'spring cleaned'. 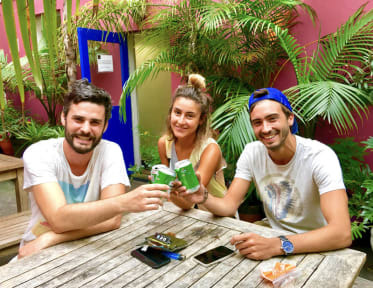 We offer a fully equipped kitchen, a TV room open until late and a large outdoor courtyard where you can enjoy the Sydney sunshine while making new friends. Feel free to use our BBQ, or chill out on the sofa in the TV room and channel surf the many channels on out Foxtel widescreen TV. Our friendly staff will help you navigate Sydney and are always ready to help with any questions you can throw at them - and if we don't know we Google it! A large, sunny outdoor courtyard area where you can relax and meet other travellers which also has a BBQ and non-smoking area. Clean, fully equipped kitchen with oven, cook-tops, double fridge freezers and a microwave. Plus all utensils are provided and we also provide condiments. A laundry room with washing machines and dryers, including ironing facilities. FREE luggage storage on the day of your departure. Plus you’re always guaranteed a smile and warm welcome at reception during check-in and throughout your stay!